Lusatia, east Germany – Up to one hundred people from the UK will join thousands from across Europe this weekend, to shut down one of the continent’s biggest opencast coal mines in Lusatia, Germany. The activists from the UK’s climate action network Reclaim the Power will participate in a mass civil trespass from 13th-16th May, organized by Ende Gelände, a grassroots anti-coal and anti-nuclear power movement based in Germany. Together, over 2,000 people will enter the lignite coal mine, to stop the digging equipment, blockade excavators, and halt coal trains from delivering coal to nearby power plants. The action will be taken in solidarity with local communities, who have struggled against mining and resettlement for years. The activists will demand an immediate stop to coal mining, and a transition to 100% renewable energy, as part of a democratic and sustainable solution to climate change. The action also sends a strong signal to the mine’s owner, Swedish company Vattenfall, to phase out coal mining in Germany and do more to protect the welfare of its employees. Vattenfall is currently struggling to secure the sale of its lignite mines and power plants across Germany, which generate around 10% of the country’s electricity, and are among Europe’s top 10 biggest emitters. This weekend’s action in Lusatia, south of Berlin, will follow Reclaim the Power’s recent mass action on 3rd May, when several hundred people halted operations at the UK’s largest opencast coal mine in south Wales, using their bodies to form a massive red line across the mine. The action in south Wales was taken in solidarity with the local community, who have been battling against the Ffos-y-fran mine, owned by Miller Argent, for nearly a decade, and now face the threat of a new mine next door. Globally, coal is facing a downturn, and on Tuesday this week – for the first time ever – the UK’s electricity grid had zero coal generation input. However, coal companies like Vattenfall continue to block vital climate change legislation, which would help to ensure fossil fuels remain in the ground, and promote a transition towards renewable energy. “Two weeks ago I joined hundreds of UK activists to shut down the Ffos-y-fran mine in Wales. Now I am on my way to Germany to do the same again at one of the biggest opencast coal mines Europe. Climate change is a global problem, and we need global resistance to make sure fossil fuels remain in the ground. 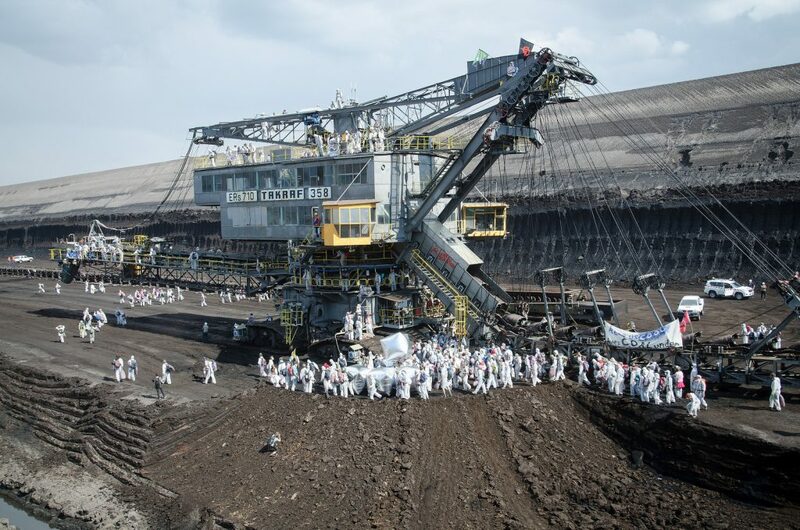 “This weekend’s action will show any future buyer of the lignite mines in Germany that all coal development will face resistance from the climate justice movement. We are the investment risk. More information can be found in this media pack. If journalists would like to visit Ende Gelände, here’s an info sheetwith some practicalities. To keep global temperatures from increasing beyond 2oC, scientists say we need to keep more than 80% of coal reserves in the ground. 195 countries agreed in Paris in December 2015 to keep temperature rise below 1.5OC, and reduce carbon emissions to ‘net zero’ in the second half of the century. As of September 2015, 2168 people were employed in coal extraction in the UK. In comparison more than 110,000 people in Britain had jobs in renewable energy generation as of May last year. The coal industry is collapsing globally. Since the start of 2016, the largest US coal company Peabody Energy has filed for bankruptcy and the Chinese government has cancelled over 1000 planned coal mines. is a UK based direct action network fighting for social, environmental and economic justice.